Simply follow : TouchMatter ! If you are reading this page because you have downloaded the 'cracked' version of Photo+Map, then you will have discovered that pirated copy of Photo+Map do not work. If you want to try out Photo+Map then use the Lite version and if you like the app then purchase the full version. Sorry no free lunch here ! Build your own Street View image with Photo+Map ! Have you ever wanted to remember a cool place, took a picture of it but later on forgot how to get back to it ? Not anymore with Photo+Map the easy-to-use iPhone/iPod Touch® application that let you combine your photo and map(s) all on the same final picture. The latest version 1.4 is now available on the AppStore in the Photography category in . 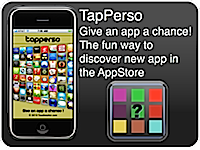 You can view a video of version 1.0 (couple months old) by clicking here. Photo+Map Version 1.4.1 is a minor update that let you upgrade from the Lite version to the full version by using the In App purchase system offered by Apple. If you want first to try out Photo+Map, a free "Lite" version is available in the AppStore. 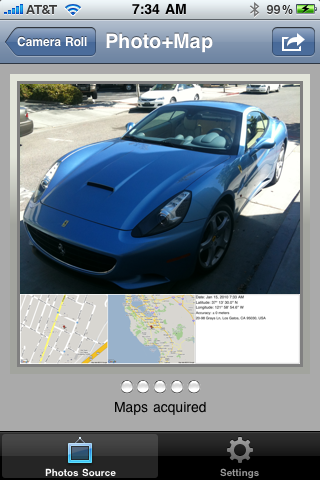 Photo+Map Lite is a good way to experience all the Photo+Map's features - but with some limitation. Read the FAQ page to understand the difference between the Lite and full version. With Photo+Map 1.4.1, you can now upgrade directly to the full version directly by purchasing InApp the unlock addon. 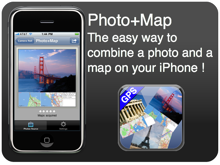 Photo+Map is a utility application that let you combine up to 4 maps with a photo from your device. You can use the built-in camera to take a photo or use a photo from your camera roll. In the Settings tab you can control each map zoom level, and various other settings of the application. Photo+Map is now available in the AppStore : Download it now from . Photo+Map Lite is available also in the AppStore : download it now. If you have any question please send an email and use the following email address : moc.rettamhcuot@troppus. Version 1.4 add the support for Google as the map provider in addition to Yahoo. You can select your default map provider in the Settings screen. Version 1.3 is adding the capability to extract the GPS information from the EXIF meta-data for your photos in your camera roll. By design Photo+Map manipulates a lot of data to build the final photo with the maps. Such image manipulation require the application to have access to enough memory (RAM). If Photo+Map quit often while working with a photo, please reboot your iPhone. When a crash occurs, the memory (RAM) left for Photo+Map to run smoothly is insufficient and rebooting should solve the problem.